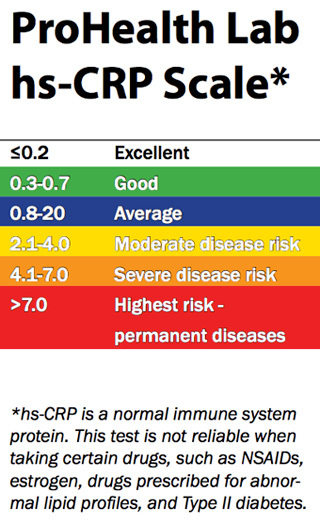 Several studies have associated hs-CRP, which is a marker for inflammation, with an increased risk of several conditions, including heart attack, stroke, sudden cardiac death and artery disease. hs-CRP levels may also help predict heart attack risk in women with the Metabolic Syndrome, which is a cluster of symptoms that include: abdominal obesity, high triglycerides, low levels of "good" or HDL cholesterol, high blood pressure, and high blood sugar. 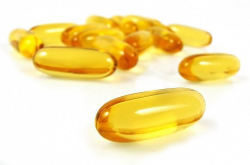 Taking a daily dose of omega-3 fish oil supplement [eicosapentaenoic acid (EPA) or docosahexaenoic acid (DHA)] has also been found to lower hs-CRP levels and reduce risk of heart attacks and sudden death from irregular heart rhythms. Weight loss, regular exercise, adult low dose aspirin and a cholesterol lowering "statin" agent should be used in conjunction with the omega-3 fish oil supplement. I used to encourage the use of a daily multi-vitamin (especially containing folic acid, Vitamin B6 and B12 to lower homocysteine levels), but more recent data has demonstrated that despite lowering homocysteine levels, there is no actual reduction in cardiovascular disease. Note: studies suggest that Vitamin E may negate some of the effects of the "statin" cholesterol lowering agents, so I am now advising patients who are on a "statin" not to take additional Vitamin E.
Researchers have found that omega-3 fatty acids from fish oils are stored in the cell membranes of heart cells and can prevent sudden cardiac death by blocking potentially fatal heart rhythms. In an animal study, researchers found that adding omega-3 fatty acids to heart cells prevented deadly heart rhythms that would have been normally induced by toxins. Researchers say this protective effect might explain the lower rates of heart-related death found in previous studies on fish oil. Researchers say the omega-3 fatty acids found in fatty fish such as tuna, salmon, and bluefish can prevent sudden cardiac death by blocking fatal heart rhythms. After her mother unexpectedly died from a tear in the wall of her heart at age 63, Patricia Walters talked to her doctor, Leslie Cho, about how to better monitor her own heart health. Pregnant at the time with her own daughter, Ms. Walters, now 46, says she was "a nervous wreck" worrying that she, too, might face serious cardiac risk. As part of an overall health evaluation after the pregnancy, Dr. Cho, director of the Women's Cardiovascular Center at the Cleveland Clinic, recommended a simple blood test called hs-CRP—for high sensitivity C-reactive protein, which is a marker for inflammation in the body. Easily done at the same time as a cholesterol screening, and covered by most insurance, the test is increasingly being used as a routine screening tool for patients with one or two risk factors to help assess their heart-attack and stroke risk. The hs-CRP test is a newer, more sensitive version of a standard CRP check, and experts say it can more accurately detect lower concentrations of the protein, making it more useful in predicting a healthy person's risk for cardiovascular disease. It measures CRP in milligrams per liter of blood: less than 1.0 mg/l is considered low risk; 1.0 to 3.0 mg/l is average risk; and greater than 3.0 mg/l is considered high risk for cardiovascular disease. The American Heart Association and the American College of Cardiology both have endorsed the use of hs-CRP for "intermediate risk" individuals. And one major study suggests that even people with minimal risk factors in their late 50s and early 60s should have the test. While inflammation is the body's natural response to a variety of physical states, including fever, injury and infection, research shows it also plays a role in a range of chronic illnesses, including cardiovascular disease. Inflammation of the arteries has been linked to heart attack, sudden death and stroke, Dr. Cho notes. Those who smoke, have high blood pressure, and are overweight and sedentary tend to have high levels of CRP—and those who are thin and fit have lower levels. But genetic factors can also contribute to elevated CRP in people without traditional risk factors. Research shows that elevated levels of CRP are at least as predictive of cardiac risk as cholesterol levels. A 1997 study of healthy physicians, published in the New England Journal of Medicine, was the first to show that relative risk of first heart attack or stroke was directly related to elevated CRP levels. And the Harvard Women's Health Study, which looked at 12 different markers of inflammation in healthy postmenopausal women, found that after three years CRP was the strongest predictor of risk. While some experts don't think the hs-CRP test adds much to current cardiovascular risk-prediction strategies, others say a large study known as the Jupiter trial supports broad use of the test to find people who may assume their low cholesterol levels protect them from heart trouble—and determine whether they might be candidates for treatment with statin drugs. The 2008 study showed that in patients with low levels of LDL—the bad cholesterol—but high hs-CRP levels, the statin Crestor reduced the risk of heart-related death, heart attacks and other serious cardiac problems by 44% compared with those given placebos. Paul Ridker, a Harvard University researcher who led the Jupiter study, says, "We know that those with elevated hs-CRP are at high risk even if cholesterol levels are low, and that statin therapy can reduce the risk of heart attack and stroke in this group." While the study showed inflammation contributes as much to cardiovascular risk as does high blood pressure or high cholesterol, Dr. Ridker says "the core research question now is whether or not reducing inflammation per se will reduce that risk." Something to Talk AboutDr. Cho at the Cleveland Clinic says the test can help identify those patients at intermediate risk and open the discussion about prevention and treatment. "If you are 53 and chubby with high blood pressure and borderline high cholesterol but your CRP is normal, I'm not sure I would throw the whole kitchen sink at you," says Dr. Cho. "But if your CRP was elevated, I would want to talk to you about the Jupiter results" and discuss starting a statin. She also counsels patients with elevated levels about lifestyle changes including weight loss, nutrition and exercise. Ms. Walters didn't have high levels when she was first tested, but they began to rise in later screenings. She now takes a statin and has her blood monitored regularly. She also joined Weight Watchers to drop a few pounds and runs with friends for exercise. A former teacher who is now a stay-at-home mom, Ms. Walters says, "I have a little girl, and I plan to be here for everything." Reducing the levels of a certain protein secreted by the body may be as powerful a tool in slowing heart disease and preventing heart attacks and cardiac-related death as lowering cholesterol, two teams of researchers are reporting today. The studies, being published in The New England Journal of Medicine, provide the strongest evidence yet that the protein - known as CRP, for C-reactive protein - plays a role in heart disease. The participants were patients with severe heart disease who were taking high doses of statin drugs, which reduce both cholesterol and CRP. Lower CRP levels, the researchers found, were linked to a slower progression of atherosclerosis and fewer heart attacks and deaths. And this effect was independent of the effect of lowering cholesterol. "What we now have is hard clinical evidence that reducing CRP is at least as important as lowering cholesterol," said Dr. Paul Ridker of Brigham and Women's Hospital in Boston, the lead author of one of the studies. But other heart disease researchers cautioned that more work was needed to prove that CRP directly causes heart disease. And most agreed that because the new studies involved only people with severe heart disease, it remained unknown whether healthy people would benefit from reducing their CRP levels. Still, the study investigators said they suspected that the results would be shown to apply more broadly. If they are correct, a huge new market for the already popular statins could be opened among people whose cholesterol levels are normal but who have high levels of CRP. 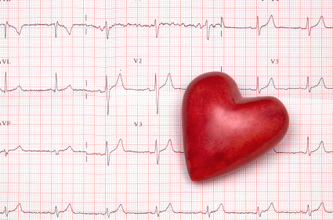 Of people stricken by heart attacks, half have normal cholesterol readings. Dr. Ridker's study addressed the question of whether CRP levels independently predicted heart attacks and deaths. The second study, by Dr. Steven E. Nissen of the Cleveland Clinic and his colleagues, asked whether CRP independently predicted heart disease progression. Some heart disease experts said the new studies offered persuasive evidence that doctors should focus on keeping CRP levels low in patients with severe heart disease. "This is missing-link evidence," said Dr. Sidney Smith, a cardiologist at the University of North Carolina who is a past president of the American Heart Association and co-chairman of a committee of the heart association and the American College of Cardiology that sets treatment guidelines. Others, though, said CRP could instead be a marker for something else being fought by statin drugs to reduce heart disease risk. "These are very important papers," said Dr. James I. Cleeman, coordinator of the National Cholesterol Education Program at the National Heart, Lung and Blood Institute. "They are provocative. But we need to recognize that the relationship between CRP and heart disease is a developing story. This adds to the evidence, but I'm not sure it settles the issue." CRP levels are low in healthy young people - usually less than one milligram per liter of blood - but they rise with age and with obesity, diabetes, smoking and a sedentary life. If people lose weight, stop smoking, exercise or take oral diabetes drugs, their CRP levels fall. But a third of the population has levels greater than three milligrams, and levels that high have been associated with heart disease risk, Dr. Ridker said. Even before the new findings, evidence had been mounting that CRP and heart disease were somehow linked. Scientists have developed hypotheses to explain why, proposing that the protein could cause plaque to develop in coronary arteries, lead plaque to burst open or bring on the formation of blood clots that then block arteries and cause heart attacks. Some drug companies have started programs to develop drugs that make a specific target of CRP and prevent its synthesis. But what the findings of those studies mean remains uncertain. That CRP levels drop with exercise and weight loss, for example, has led some experts to argue that the protein is a marker of heart disease risk, not a cause, just as gray hair is a marker rather than a cause of aging. CRP is made in the liver and also in the walls of coronary arteries and possibly elsewhere in the body. Its levels, which can be measured with a simple blood test, often rise and remain high in patients who have chronic inflammation from conditions like rheumatoid arthritis, for example, or periodontal disease. Patients with chronic inflammation also have an increased risk of heart disease. Questions remain as to the protein's normal purpose in the body. CRP was discovered about 70 years ago by scientists who were trying to understand why some strep bacteria caused disease and others did not. It is so called because it was found in the third band, which the scientists called Band C, in a gel used to separate proteins. Then, about half a century ago, doctors noticed that after a heart attack, CRP flooded the patient's blood, and for a while the protein was used to help diagnose heart attacks. Dr. Ridker's study involved 3,745 patients who had been hospitalized with heart attacks or with severe chest pain from the blocking of coronary arteries and who were then followed for two and a half years. Dr. Ridker said that when the study, sponsored by Bristol-Myers Squibb, was being planned several years ago, the thought was that it would ask whether moderate statin therapy - 40 milligrams a day with Pravachol, a Bristol-Myers product - was as effective in preventing heart attacks as more intense therapy: 80 milligrams a day of Lipitor, a statin made by Pfizer Inc.
"I said, 'This is a good study, but it can be better,' " Dr. Ridker said. He proposed also asking about CRP. Would there be fewer heart attacks and deaths among people in the study with lower levels of the protein? Dr. Ridker said he would have been happy to find a benefit in lowering CPR levels that was only 10 percent or 20 percent that of lowering cholesterol, adding, "We never dreamed we'd get a risk reduction as large as the risk reduction from lowering LDL cholesterol" - that is, the "bad" type of cholesterol. Dr. Nissen's study, sponsored by Pfizer, examined plaque in the coronary arteries of 502 patients with heart disease, comparing intense statin therapy against moderate and using the same doses of the same drugs as in Dr. Ridker's research. Intense therapy resulted in lower cholesterol levels and slower growth of plaque, Dr. Nissen reported. But he also suspected that something else was going on, because some patients seemed to be doing much better than others with the same cholesterol levels. Upon further analysis, Dr. Nissen found that levels of CRP dropped independently of cholesterol and that these reductions were independently associated with a slowing of disease progression. In patients who achieved low levels of both CRP and cholesterol, he found, plaque in the coronary arteries actually regressed. "I'm looking right at the plaque, and when your CRP level is reduced, you are stopping the disease," Dr. Nissen said. "We are saying that CRP is a direct participant in atherosclerosis." The next step, Dr. Ridker said, is to see if reducing CRP levels can prevent heart attacks in healthy people. His new study will enroll 15,000 people with normal cholesterol levels but higher-than-average levels of CRP, above two milligrams per liter of blood. The participants will be randomly assigned to take either 20 milligrams a day of a statin - Crestor, made by AstraZeneca - or a placebo. Some experts say the latest findings make it clear that doctors should monitor CRP levels in patients with severe heart disease and do whatever it takes, including giving high doses of the most powerful statins, to get levels below two milligrams per liter of blood. "What these two papers are saying is that not only is CRP a risk factor on its own, but we should be aggressively treating it," said Dr. Valentin Fuster, former president of the American Heart Association and director of the cardiovascular institute at Mount Sinai School of Medicine in New York. But Dr. Daniel Rader, a heart disease researcher at the University of Pennsylvania, said this might not be so easy in patients already doing everything possible. "You've already counseled them about lifestyle, you've already given a statin, you're already targeting LDL cholesterol to less than 70," a very low level that is recommended by the current guidelines, he said. "So if you find a high CRP, what do you do? Do you tell the patient, 'Oh, this is bad. You're at high risk'?" A difficult question, Dr. Ridker said, but one he predicted would not arise very often. Most patients with severe heart disease are not taking high doses of statins, he said, so there is room for doctors to experiment with higher doses and different drugs to reduce CRP levels if necessary. "There is a huge payoff" if doctors understand that they need to test not just for cholesterol but also for CRP, Dr. Ridker said, adding, "That alone will save tens of thousands of lives right there." New blood tests that doctors hoped would more accurately predict which patients are headed for a heart attack or a stroke are no better than cholesterol levels, blood pressure, and other conventional measurements, a study has found. In recent years, doctors have had high hopes over substances in the blood that appeared to be powerful new predictors of a heart attack. These substances included C-reactive protein, a measure of inflammation; homocysteine; and B-type natriuretic peptide. An increasing number of family doctors have been ordering tests for these substances in hopes of identifying people who do not have the standard risk factors but are still likely to suffer a heart attack or stroke. But the new research, by scientists at the highly regarded Framingham Heart Study, found that tests of C-reactive protein, B-type natriuretic peptide, homocysteine and seven other substances are only a couple of percentage points better at predicting outcomes than the standard risk factors that doctors have known for decades. The difference in accuracy was considered negligible. "It's a little bit disappointing," said the lead author, Dr. Thomas J. Wang, a Harvard Medical School assistant professor. "I think our study and some other recent studies have begun to dampen that enthusiasm." The study is being published in today's New England Journal of Medicine. The Framingham researchers, who have been testing residents of the Boston suburb for more than 50 years, used frozen blood samples taken from 3,209 healthy Framingham participants in the mid-1990s, then checked to see who had major heart complications or who had died over the following decade. The best predictors were tests for B-type natriuretic peptide, C-reactive protein, homocysteine and renin in the blood and albumin in the urine. Patients with the highest levels of B-type natriuretic peptide and albumin were nearly twice as likely as those with lowest levels to suffer a heart attack, stroke or heart failure; those with the highest levels of C-reactive protein, B-type natriuretic peptide, and the three other substances were four times as likely to die during the decade. But standard risk factors, such as high blood pressure, high cholesterol, family history, advanced age, smoking, obesity, lack of exercise, and diabetes, were just as accurate as predictors of possible heart attack or stroke. "This really supports the value of focusing on risk factor reduction, not looking for a magic blood test," said Dr. Richard Stein, who is the director of preventive cardiology at Beth Israel Medical Center in New York. He predicted that some insurance companies will soon start telling doctors to limit such tests, which are not covered by some insurers. The study, presented Sunday at an American Heart Association convention in New Orleans and published online in The New England Journal of Medicine, found that the risk of heart attack was more than cut in half for people who took statins. The study is sparking debate over who should take a blood test to check CRP and under what circumstances someone with high CRP should be given a statin. Because heart disease is a complex illness affected by many risk factors — including smoking, hypertension, being overweight and having a family history of heart disease — most researchers said high CRP alone should not justify prescribing statins to people who have never had heart problems. Some experts cautioned against testing people for CRP unless they had other indications of being at risk for heart disease, and they said more research was needed to pinpoint the patients for whom the benefit of statins outweighs the risks. Others recommended testing more frequently and using statins for people with low cholesterol if they have high CRP and some other risk factors. The study, called Jupiter, is also fueling a debate among scientists about CRP’s importance and inflammation’s role in heart disease. Dr. Nabel said national panels were likely to revise their official guidelines for doctors, which she described as “silent on CRP,” to recommend CRP testing and statin therapy for some people not previously considered candidates. The leader of the Jupiter study, Dr. Paul M. Ridker, director of the Center for Cardiovascular Disease Prevention at Brigham and Women’s Hospital in Boston, said his team estimated that expanding statin use to the types of patients he studied could prevent about 250,000 heart attacks, strokes, vascular procedures or cardiac deaths over five years. Some experts not involved in the Jupiter study said several million more Americans should probably be taking statins. “The Jupiter trial very convincingly used CRP as a way to identify another group of high-risk individuals who wouldn’t otherwise have been treated, and supports the concept that those people should be treated with a statin,” said Dr. Daniel J. Rader, a heart researcher at the University of Pennsylvania School of Medicine who was not connected to the study. Several experts said that although the research was significant and would affect clinical practice, the study as published in the journal did not give enough detailed information to indicate exactly which patients should now be tested for CRP or given statins. In an accompanying editorial, Dr. Mark A. Hlatky, a professor of health research at Stanford University, said among other things that the study, which tested people with CRP levels over two milligrams, did not indicate whether that level or a higher CRP level should be the threshold for treatment. The study also did not answer some questions about risks of giving statins to relatively healthy people, he wrote. Dr. Sidney Wolfe, director of the health research group for Public Citizen, a nonprofit consumer advocacy organization, said the Jupiter study also did not give enough detail about the effect of statins on participants who had only high CRP, compared with those who also smoked or had a condition called metabolic syndrome. Some experts questioned whether stopping the trial early had limited the possibility of some more meaningful data. The trial was one of the few to test statins that included many women, Hispanics and blacks, groups that all showed similar benefit from statins. Like many clinical trials, Jupiter was sponsored by a pharmaceutical company, in this case AstraZeneca. It makes the drug in the trial, rosuvastatin, which is sold as Crestor. The most potent statin on the market, Crestor has been criticized by consumer health advocates who say it is more likely to cause some rare side effects of statins — muscle deterioration and kidney problems. In 2005, the Food and Drug Administration rejected a petition by Public Citizen to ban Crestor, saying its risks were not substantially different from similar drugs. In the Jupiter study, in which people either got rosuvastatin or a placebo, there was no increase in muscle or kidney problems for those taking the statin. There was a small increase in diabetes. Dr. Ridker, a co-inventor of a CRP test, said he first sought federal financing for the study and was turned down. He and the other scientists interviewed for this article, except for Dr. Nabel, Dr. Gardner and Dr. Wolfe, have consulted for or received research money from companies that make statins. Although Crestor, which has 9 percent of the American cholesterol-lowering market and costs about $3 a day, was used in this study, several experts said it seemed likely that the effect would be the same for other statins in appropriate doses, including generics, which are much cheaper. Lisa Nanfra, executive director of commercial operations for AstraZeneca, said the company believed there was a “unique profile of Crestor” and that the drug was “the most effective statin at lowering” bad cholesterol. The company plans to use results from the Jupiter study to seek F.D.A. approval to widen its claim about Crestor's effectiveness. The role of CRP and inflammation in heart disease is hotly debated. Dr. Ridker believes inflammation plays an important role, probably by causing plaque in the coronary arteries to rupture. Others say cholesterol is much more important. Dr. Scott Grundy, a heart expert at the University of Texas Southwestern Medical Center, pointed out that in the Jupiter study, the statin not only lowered CRP but also significantly cut already low cholesterol levels, raising questions about whether the benefit actually came from giving patients superlow cholesterol. And because CRP can rise with short-term infections unrelated to chronic inflammation, some experts said results of a CRP test needed to be weighed against other aspects of the patient’s health. i) Take a good fish oil supplement twice a day. ii) Get plenty of omega-3 fatty acids from natural sources, including fresh wild salmon or canned sockeye salmon, sardines, herring, omega-3 eggs, avocados, hemp seeds and/or ground flaxseeds. iii) Include nuts and other seeds in your diet, including walnuts, almonds, cashews, pumpkin seeds and sunflower seeds. Restrict consumption of peanuts (they are a legume, not a nut). iv) Avoid trans-fats, hydrogenated oils, margarine and vegetable oils and shortenings like the plague. Use olive oil for salads and low-temperature cooking. vi) Reduce intake of foods high in saturated fat. Not all saturated fat is necessarily bad (in fact, your body requires it), but saturated fat should be eaten in moderation. Better sources of saturated fat are coconut milk and virgin coconut oils, organic meats (non-steroid, non-hormonal, pesticide-free fed sources), and limited amounts of natural organic dairy products such as milk, cheese and yogurt. vii) Eat carbohydrates with a low glycemic load. This will mean the majority of your carbohydrates will come from vegetables, and to a lesser extent, fruits. Restrict your consumption of grains or grain products. When you do eat grains, stick to whole, unprocessed grains, and preferably consume them directly after exercise. That’s when your body can make use of them to replenish its glycogen stores. viii) With every meal, choose a lean protein, a vegetable, and a good source of fat (preferably a source of omega-3s). Load up on the fresh vegetables, and include plenty of greens, as well as the other colour groups. Eat lots of cruciferous vegetables like cabbage, broccoli, and Brussels sprouts. Limit consumption of the nightshades (peppers, tomatoes, etc.) until the inflammation is under control. ix) Eliminate all sugary drinks, including juices. Drink water and green tea instead. Avoid diet drinks and beverages that are filled with chemicals and additives. x) Regularly eat ginger and turmeric, and include these spices in your recipes. They have been shown to lower inflammation. xi) Supplement your rich diet with a good anti-oxidant vitamin formula. xii) Choose organic, and local produce, where possible.